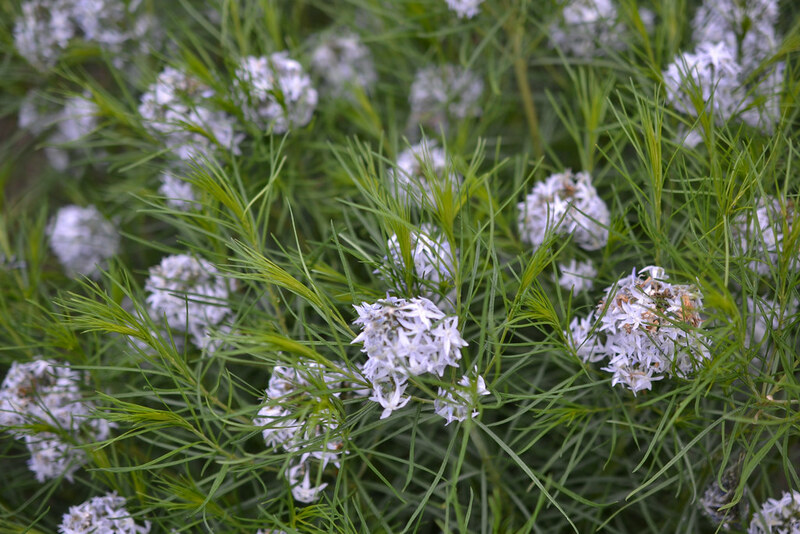 Amsonia is a small genus with a few species offering outstanding ornamental value. 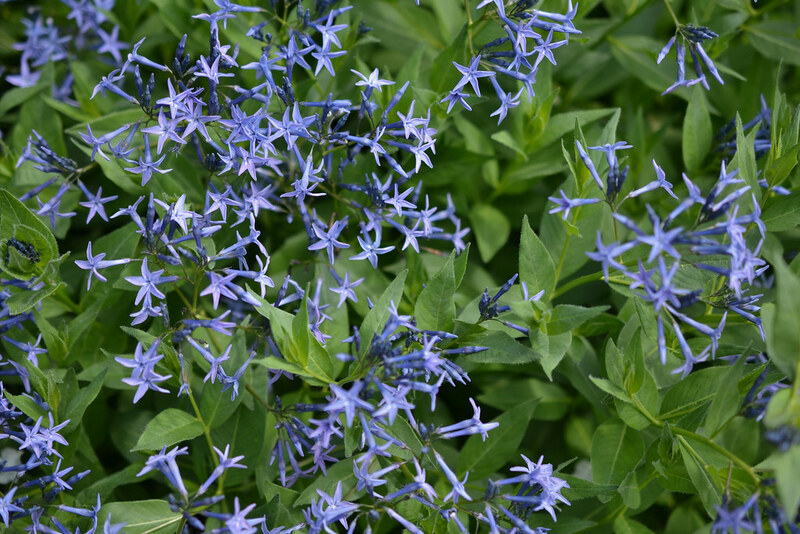 One of the loveliest is Amsonia tabernaemontana, also known as eastern bluestar, or just bluestar. A native perennial with dense clusters of pale blue spring flowers and golden fall foliage, it deserves to be included in more northeastern gardens. Eastern bluestar is a robust herbaceous native perennial native to the Midwest. Multiple single stems emerging from a basal crown often branch near the top to form a dense, shrubby plant that grows to 3½ feet tall and 2 feet wide. Lance-shaped leaves of a rich medium green are whorled up long stems that terminate in compact panicles of striking ¾-inch, bright blue star-shaped flowers that offer up a showy display from late spring through early summer. Narrow beanlike pods will often form after flowering and can offer additional late-season interest. Autumn’s cool weather brings a sunny yellow foliage display from eastern bluestar; the rich brown color of the primary veins contrasts nicely with the golden willowlike leaves. Amsonia tabernaemontana is hardy in Zones 3 to 9 and is tolerant of a variety of conditions. Though most at home in partial shade and rich organic soil with good moisture retention, it is also tolerant of drought once established and will thrive in full sun and lean soils. In the cultivated garden, eastern bluestar will benefit from a light spring mulch of well-composted manure or other organic matter. Be careful — the new shoots can be a little late to emerge, and the tender tips nestled in the crown are easily damaged by foot traffic and disturbance. The plant can be cut back in the summer by a third or half to control shape. In shady conditions, eastern bluestar tends to flop, so pruning may be necessary to avoid staking. New shoots will emerge along the stems just below the cuts and will fill out in short order to create a dense, tidy mound. At the end of the season, the erect stems can be cut close to the ground or left standing for winter interest and to provide the crown with protection from extreme winter weather. Eastern bluestar can provide excellent habitat for beneficial fauna. The flowers provide an important nectar source and the foliage is a larval food for various butterflies. Hummingbirds, carpenter bees, hummingbird moths, and several other pollinators are also drawn to the plant. The foliage contains a milky sap, characteristic of many plants in the Apocynaceae, which tends to deter predation by deer and other mammalian herbivores. Amsonia ‘Blue Ice’ is a handsome cultivar, reportedly discovered growing among seedlings of A. tabernaemontana at White Flower Farm, in Connecticut. ‘Blue Ice’ attains only 15 to 18 inches height and doesn’t require cutting back or staking. The flowers are the same size as those of A. tabernaemontana but are a slightly darker blue. Amsonia hubrichtii (thread-leaf bluestar) is another notable species, suitable for gardens in Zones 5 to 8. Similar in size and shape to A. tabernaemontana but with feathery, needlelike foliage and blossoms of a more steely blue, this native wildflower of the south-central United States offers an excellent floral display and even more beautiful fall color. Cayleb Long is the former curator of the Annual and Perennial Borders, Lily Pools, and Magnolia Plaza at Brooklyn Botanic Garden. 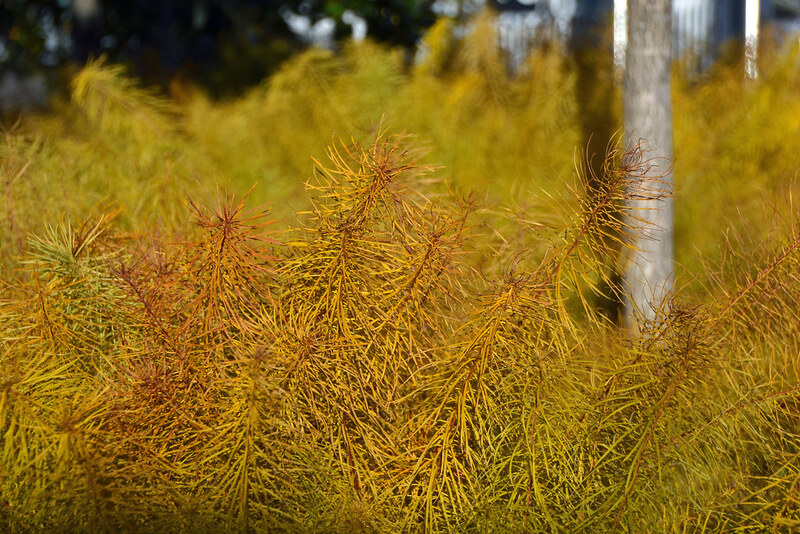 Amsonia hubrichtii in its autumn color forms a golden meadow by the Visitor Center Plaza. Photo by Lee Patrick. Spring-blooming Amsonia hubrichtii (thread-leaf bluestar) in the Brooklyn Botanic Garden's rain gardens. Photo by Morrigan McCarthy. Amsonia tabernaemontana, (eastern blue star) in the Plant Family Collection. Photo by Morrigan McCarthy.